A few weeks ago I posted pictures of a retro kitchen that was featured this year's Rockridge Kitchen Tour. That same family is doing something very cool in their backyard! Check out these pics... Diana and Craig are looking to make their oversized level and lush backyard into mod B&B. 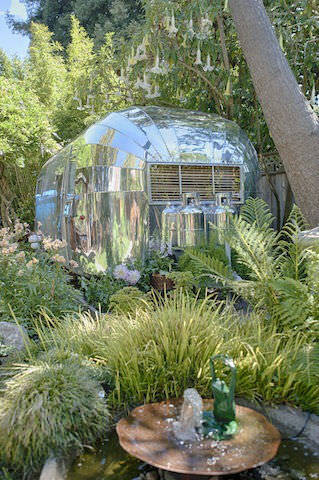 This 1956 Airstream trailer is currently being restored and will become part of a Backyard B&B next year! They have also restored this beautiful 1951 Spartanette trailer. If you are a non-profit you can now apply for a grant online, click here. The deadline for grant applications is Nov. 8th, 2012. To donate to our non-profit, click here. I am proud to be a ROOF supporter! If you follow The Oakland Berkeley Journal, you find new articles almost weekly. I am a month behind, yikes! I thought December would be a month for me to catch up and write fun articles about fantastic dinner recipes and local restaurants, but instead I found real estate to be an extraordinarily busy month. In addition to helping my clients buy incredible loft space, hillside condos and Redwood Heights properties, my services include helping clients with market analysis for taxes, property separation and more. Every January, I reflect on how the previous year turned out, what I can do better and how can I provide a higher level of service. Red Oak Realty is a company unlike many in our industry. We are hyper-local, green, technically savvy, artist, charitable and always looking to improve our service. Yesterday, was our annual 2012 Kick-Off Breakfast and I was honored to hear nationally acclaimed real estate expert, Nancy Gardner speak and consult about our economic forecast; I love how Nancy speaks with such clarity and truth. (Call me to discuss her predictions) As tradition, awards were announced and cheer was raised and in the midst of it all, I was awarded Company-Wide Top Producer, an honor that I will cherish always. I thank you, my clients for your continued support and trust and for my clients to come, please know I will continue to provide service from my heart. Oakland resident Karlya Benjamin has a vision of honoring the past and empowering the future. She feels that our elderly have so much to tell and who better to listen than our youth. Additionally, too often our seniors crave visitors. If you or your teenager have the desire to reach out and volunteer for a few hours, read a few of the details below and email me at deidrejoyner@gmail.com. What: We will go to 3 facilities to share and interact with seniors for 1-1½ hours. There are 2 facilities and two dates so far. Why: To keep us (especially teens) connected to the elderly and as human beings. By sharing with each other, we are able to appreciate the elderly as an incredible wealth of knowledge, history and strength. A lot has happened in the last 80-90 years and they’ve seen it and were a part of it. In turn, the elderly are able to see the young as possibilities to empower create and shape the world and as vessels to carry forward the knowledge of the past. Last Sunday I spent a great day at the Temescal Street Fair. The weather was gorgeous, (not too hot.) My company, Red Oak had a booth and so we were right there in the middle of the action. It was quite a cast of characters. 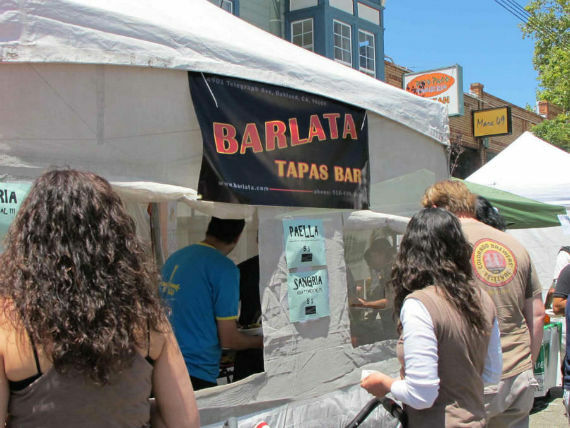 There was live wrestling, not something you see at many street fairs, and my favorite, Barlata Tapas Bar with their famous paella. Besides meeting our neighbors, Red Oak was there to promote the launch of our new neighborhood video series. It’s so fun to see all my neighbors out and about. If you are not familiar with this vibrant neighborhood of Oakland, it’s worth a special trip, even on a non-street-fair day! Amy Perl's (http://www.amyperl.com/) latest photo art work and Craig Erickson's (tmdwblog.blogspot.com) awesome illustrations on wood + resin art work will be on display. Fivetenburger (delicious food! ), as well as super cool crafters Hoof and Horn (hoofandhorn.tumblr.com), A Boy Named Coy (aboynamedcoy.com), and Cougar Horse (http://cougarhorse.com/) will be open with their custom clothing designs, and some great artisans' work! It should be a fun time! This is in conjunction with Piedmont Avenue's first monthly THIRD THURSDAY ART WALK. 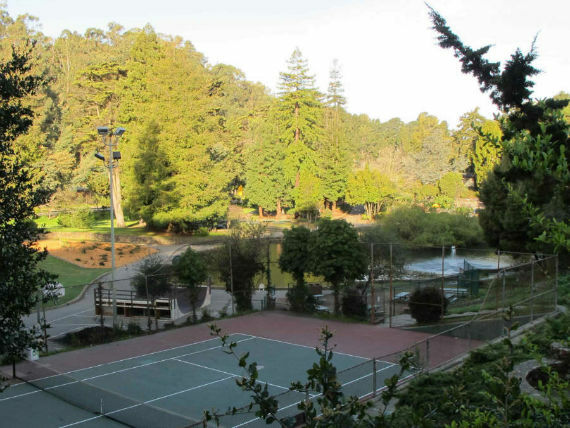 Play tennis in the public court. The other week, Red Oak Realty was a sponsor at Rebuilding Together Oakland at Peralta Hacienda Park in the Fruitvale district of Oakland. This was a day for people to come together and clean up a neighborhood staple. This park is gorgeous and as I was pruning, I thought, "why have I not been here before?" Since this clean up day I have visited their website and noticed they do events. Thursday December 2nd, A Night of Zorro, the myth, the music, and the movie at Peralta Hacienda Park. For more information about how to qualify for service for Rebuilding Together Oakland, click here! Listed on the National Register of Historic Places, click here to learn more about the grounds. Can you make the cut? So You Think You Can Dance hits Oakland. One of my favorite reality television shows is, So You Think You Can Dance. I grew up in the dance studio. From the early 1970's I was always at Everybody's Creative Art Center turned City Center Dance Theater after school. To my mother's disappointment, I quit dancing when I turned 20 and I often regret it as well. What I love about this show is that it showcases all forms of dance, from hip-hop to ballroom, contemporary and many more. I was so excited when my friend Karlya called me this morning to tell me that auditions were being held at the Paramount Theater on Broadway. After dropping my children off at school I headed downtown to see the dancers line up. I am glad to see that Oakland was selected to be an audition city. When Jeff and Kersti first got together, they contemplated selling the Redwood Heights home and buying a house together. After doing a little house hunting they realized Redwood Heights was a perfect place to stay. They expanded their home, by adding a master bedroom suite and enlarged the kitchen \ Last year I met Jeff and Kersti at an open house and it turned out they live around the corner from me. October was nearing, and after a nice chat, they were kind enough to invite me to their Octoberfest, featuring Jeff's home brew made with their homegrown hops. Jeff has a passion for beer, so much so, he installed a brew room when they remodeled their home. A year later, Jeff's hops were ready to harvest and I was invited over to see the buds that gives beer it's bitter edge. I am always inspired by homes that people create. It is more than just the remodeled kitchens or furnishings, it's about the way people transform their properties to fit their lifestyle and give them maximum enjoyment. Speaking of beer, save the date for Oaktoberfest! October 9th, 11am- 6pm @Fruitvale and MacArthur. Red Oak is proud to be a sponsor of this neighborhood festival. Come down to the Red Oak booth and visit me, I would love to meet you and answer any real estate questions you might have. Thanks Kersti and Jeff for showing me your gorgeous home and allowing me to have a glimpse of your life. It is really cool that we have a lake in the middle of our city! Year-round Lake Merritt is Oakland's most popular gym. (I say this with no statistical data!) Recently, I have been a major exercise slacker! So I am posting this to self motivate. I have heard rave reviews about the documentary, Race to Nowhere. (Click here to view the trailer) See it on Thursday, February 11 at 7 PM, at the Grand Lake Theater in Oakland. Tickets may be purchased at the box office.